Parents of children at a secondary school in County Fermanagh say they have been left stranded by a decision to withdraw free school bus passes. The Education Authority (EA) has sent letters to around 17 pupils of St Mary's High School in Brollagh. The letters, sent last week, state that the school bus route has been reorganised for operational reasons. Only children who live more than three miles from the school are eligible for free transport. Concessionary transport for pupils living closer to the school is no longer available as the EA has said there are no spare seats. A spokesperson for the Education Authority said that "all eligible children have been allocated seats" and that it would conduct an assessment of the route that some children will now have to walk. The school is around two miles from Belleek and parents say there is no public transport and walking is too dangerous. Parent Rita McLaughlin described the road as "lethal". "A child couldn't possibly walk on this road, it's not possible, it wouldn't be safe." Siobhán McGrath said she does not know how she will get her son to school as she cannot drive. "There's no footpaths, there's hardly enough room for two cars to drive on it really, it's way too narrow, I don't know how they expect kids to walk on it." Julie Kane explained that her daughter had a free bus pass last year. "I don't understand why she could get a bus for one year and why it was taken away especially when there is plenty of seats available on the bus." 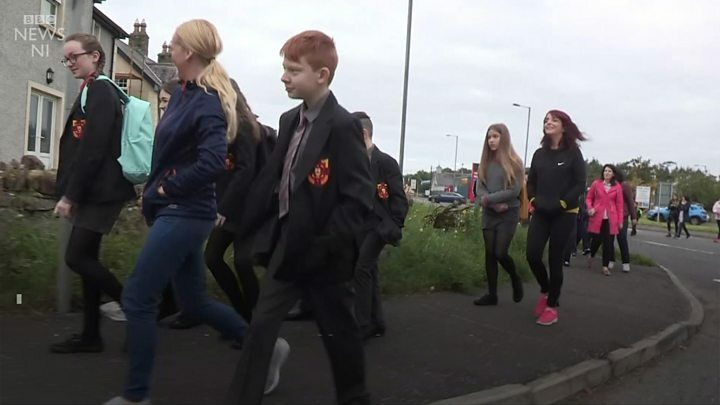 This morning parents and pupils held a protest and walked part of the route to the school. St Mary's High School in Brollagh is surrounded by fields on the B52 between Belleek and Garrison. Parents and pupils began the journey to school on foot but stopped when the footpath ended at the edge of the town. From here it's more than a mile along a winding rural road with a 60mph speed limit before you arrive at the school gates. There are no footpaths, no streets lights and in some places not even a grass verge between the hedges. Jane Weir, chair of the Parents Council at St Mary's High School, said the EA needs to reverse its decision and provide the transport the children need to get to school, as it has done for the past four years. "As we walked some children to school this morning two Education Authority buses passed us, 33 seaters," she said. "One bus had one child sitting on it and the other bus had about 14 children sitting on it whilst our children stood on the side of the road unable to get to school." An Education Authority spokesperson said: "All eligible children have been allocated seats on services operating to St Mary's Brollagh from September 2018 and in the absence of any spare capacity the Authority is unable to provide concessionary transport. "EA will conduct an assessment of the walking route; however, this cannot take place until normal school time traffic patterns are in place. "The process for the assessment of a walking route requires a number of site visits and will take a number of weeks to fully complete. "In the interim, it remains a parental responsibility for the parents of non-eligible pupils to make their own arrangements to get their children to and from school; and where parents do choose to walk it is reasonably assumed that parents will act responsibly and ensure their child is accompanied and that the pedestrian rules of the Highway code are adhered to."